Everyone gets their weather news in different ways. Some listen to news reports. While others check it out online, or use a weather app. But, those ways are not the most accurate ways to get the weather. Often times, weather reports from a news station or online are not applicable to the user. This is because the weather data is based on stations that are not close by. A weather sensor, however, is a good way to receive accurate weather that is relevant to the user. And, data is gathered right from their own back yard. The AcuRite is a family-owned company based in Wisconsin. They are an industry leader for products in temperature and weather products, and precision time products. And, they have over 70 years of experience. The AcuRite brand name has developed a reputation for user friendly weather products. They are also known for precision accuracy. And, a helpful and knowledgeable customer service team. The AcuRite 02064 model is for anyone who needs accurate weather forecasting. Unlike other weather forecasting reports and broadcasts, this weather sensor gives relevant, and up-to-date information from a user’s own backyard. It is pricey. But, it’s easy to use. So, for people who are willing to make the investment, it is easy to set-up and use. It may take some playing with the sensor positioning to receive accurate results at first. Once it’s mounted accurately, however, there is no further need to play with the positioning. So, whether someone needs to know the weather to gauge commute time, or wondering if the weather will hold for that outdoor picnic, the 02064 model can deliver real-time, accurate information. Finally, this model also offers a feature in which users can download weather information. The downloaded info may be used to create CSV data sheets. This is useful for planning future events. The AcuRite 02064 model comes with a digital display, weather sensor, power adapter, and USB cable. It also comes with mounting hardware, and a mounting bracket for the weather sensor. Unfortunately, if the weather sensor needs to be mounted to a pole outside, users have to purchase that themselves. It also does not come with backup batteries; they also, need to be purchased separately. This weather sensor measures 5 weather aspects: wind direction and speed, humidity, rain, and temperature. The weather condition data collects from a sensor right outside the user home. So, users know exactly what the weather is like before stepping out the front door. It works for temperatures as low as -40° and communicates a signal as far as 330 feet away. Next, the display is powered by a wall plug, but it also has an optional power backup for batteries. The unit itself has a dimmer that is adjustable. The actual display features a variety weather information. Users can look at the weather ticker that streams weather data in real time. Ticker information includes “feels like” temperature, indoor comfort level, and moon phase. Additionally, the PC connect feature allows users to check out their weather station info online. Simply connecting the station display to the PC lets user’s program alerts. And, users may also view information from any web browser. Unfortunately, the PC connect feature is sometimes temperamental, and some users have problems accurately streaming data from the sensor to the PC. Users can also monitor their weather remotely using the My AcuRite app. Check out important weather info at home like temperature and humidity straight from the downloadable smartphone app. Users can also share their data with other online weather communities. The Rapid Fire updates ensures the data uploaded is always accurate. Lastly, users can also download personal weather data directly to their computer. The AcuRite sensors record data at 12-minute intervals. And the data is collated and labeled into clear columns. Wanted a weather station with internet capabilities, but leery about this AcuRite model? Or, perhaps the price is a little steep? There are many reasons why this model wouldn’t be a good fit. The Ambient Weather WS-2902 Weather Station is another unit with internet monitoring capabilities. It is also compatible with Alexa. 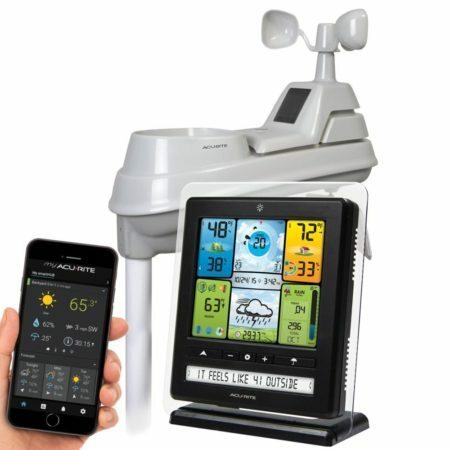 This weather station model is a bit more expensive than the AcuRite 02064 model, but it also comes with additional features like IFTTT connections to control other household devices. 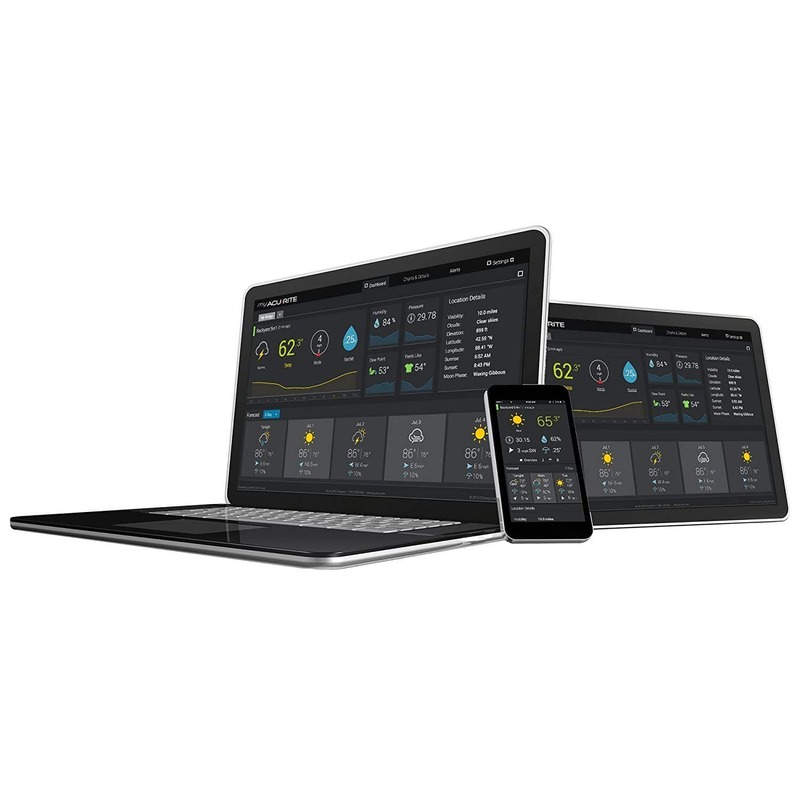 The AmbiantWeather 2902 model also allows for weather data access wirelessly across different platforms and users can program the unit to send emails and text alerts for different weather conditions. However, if a cheaper and simpler weather station is what’s needed, take a look at the La Crosse C85845 weather station. This unit is also equipped with a color, wireless display. But, it’s at a fraction of the price of other units. The La Crosse C85845 model displays basic information such as barometric pressure, temperature trends, and humidity. And, the display is bright and simple. However, it does not have an option to check data online. Nor does it have an option to download data to a PC. But, for users who just want to check the weather for the day, this basic weather station may be all that is needed. 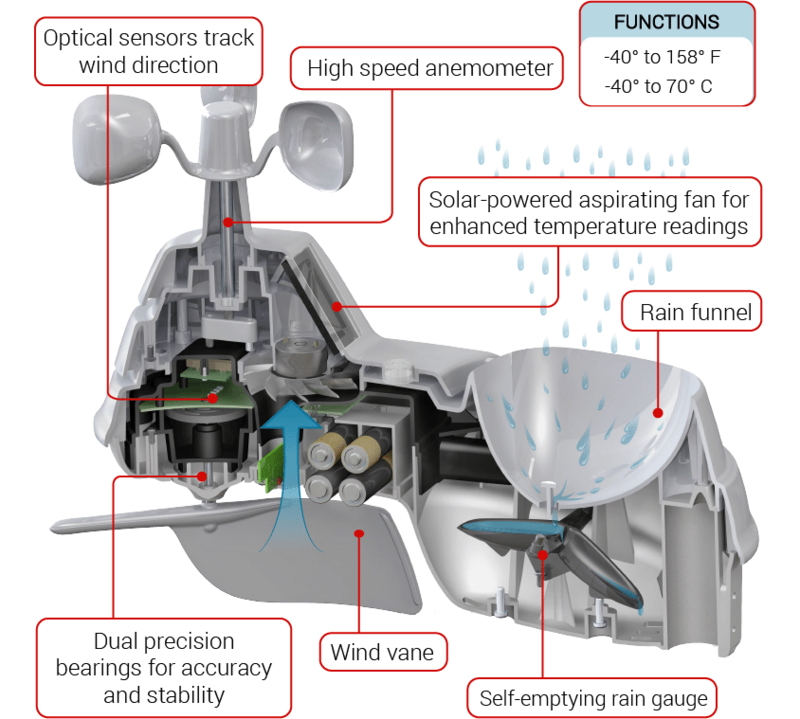 The AcuRite 02064 weather station is an intricate system that provides precision data across different platforms. It does require some setup for both the outside sensor, and the PC connection inside the home. And, it may be a little expensive for some users. However, if that is the case there are other options on the market like the La Crosse C85845 model. The La Crosse may not have all the bells and whistles that the AcuRite model does, but it is still an attractive but basic unit. Everyone’s weather needs are different. Some people like detailed information. While others only need the basic temps for the day. Luckily, there are different models on the market to suit everyone’s diverse necessities.